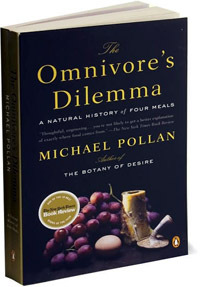 The Omnivore’s Dilemma by Michael Pollan asks the question – What we should have for dinner? It then goes on to explore several different options we, as omnivores, have to answer that question. The first option he investigates is the industrial food chain, which he quickly discovers in most cases leads back to a corn field and fossil fuels. I was amazed, and to be honest appalled, to discover just how much of our diet consists of corn. Whether it is in plain sight (high fructose corn syrup, corn starch, corn oil), fed to the animals we eat (cows, chickens, tilapia), or is hiding behind one of its many names (Lecithin, Dextrose, Ascorbic acid). Fossil fuels are used in the fertilizers to grow the corn, in the tractors to plant and harvest the corn, and in the many points along the way where ingredients and food are transported. The meal Pollan eats to illustrate this food chain is McDonald’s. Appropriately enough he eats this meal while driving down the highway. The second food chain Pollan highlights is the organic food market. This section is broken down into two different segments. The first, is large scale organic agriculture, which even though it doesn’t use harmful chemicals still, in most cases, uses mono cultures and then transports the food hundreds or thousands of miles before it reaches its final destination. Pollan cooks a meal with items purchased from Whole Foods to illustrate large scale organic ag. The second part of this section, which provides a ray of hope for the future of our food, also introduces Joel Salatin of Polyface Farm. Salatin, one of the coolest guys I have ever read about, uses rotational farming and sustainable practices to grow produce and raise livestock. He is completely transparent, allowing anyone to visit his farm and only sells food to people, restaurants, and other outlets within a 4 hour drive of his farm. Salatin comes as a breath of fresh air…literally after reading the previous sections! Pollan then prepares a meal using local produce from nearby small scale farms. In the third and final food chain, Pollan attempts to completely provide for himself by growing, hunting, and gathering his meal. He learns (more or less) how to hunt feral pigs, gather wild mushrooms, and makes a salad using greens from his own garden. He makes bread using wild yeast, and creates a dessert using cherries picked from his neighborhood. This book is life changing and should be required reading for everyone who eats!